In this chapter, you will become familiar with the different animation workflows and how they end up merging together. There is also an overview of how they work with Harmony. To begin with, let's determine what an animation workflow is. No matter which method you choose to create your project, it will always be divided in three segments. Then you will have to choose your animation method. Harmony is designed to handle part of the pre-production and all of the production. Post-production is managed in an external application. 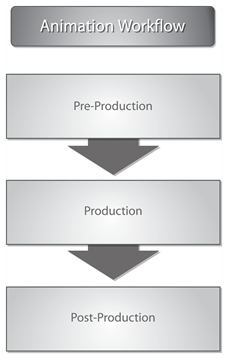 The three workflow segments are each broken down in different steps.